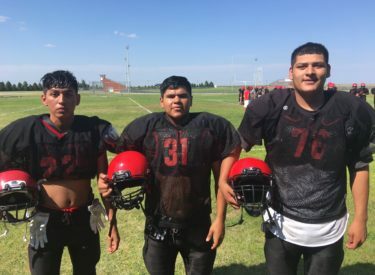 Southwestern Heights returns much of their team, yet they only have four seniors. Matt Scripsick enters his eighth year as head coach with a situation where he only loses two seniors from last season. Heights returns nine starters back on both sides of the ball. The Mustangs have a strong group of sophomores who figure to bolster the SWH charges this year. The Mustangs were 2-7 last year and 4-5 in 2015. They are trying to break a string of nine straight losing seasons. Heights will hang their hat on Sr. RB/LB Peppo Jimenez who moves from the line to the offensive backfield. Other key Mustangs include Sr. OL/DL Logan Cox, Sr. OL/DL Eric Garcia, So. RB/LB Demetrio Flores, Jr. QB/S Efren Mercado, Jr. WR/S Juan Garcia, Jr. RB/DE Jesse Olvera, and Sr. RB/CB Joaquin Escamilla. The Mustangs were featured during the Sportsguys on Thursday morning.